On Sunday October 9th, 14 runners representing Team Urban Initiatives participated in the 2016 Bank of America Chicago Marathon. 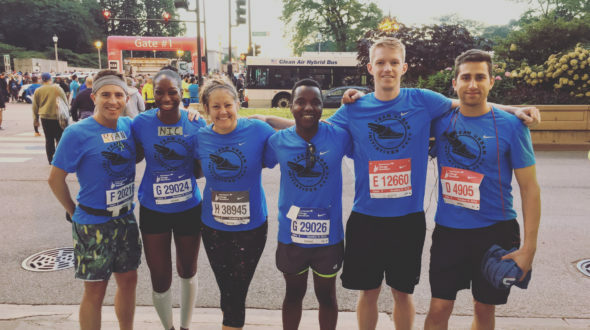 Since early this Spring, these runners not only dedicated their time to training for the event, they dedicated their time to fundraising to support Urban Initiatives’ sports-based youth development programs. “Urban Initiatives teaches students how to be healthy, leadership, setting goals, and hitting your targets. It really aligns for what you do to prepare for the Marathon” says Associate Board Member Gene Barrett about why he feels Team UI is a special team to join. Altogether, these runners raised $16,614 in support of Daley Elementary in Back of the Yards. Their efforts will provide the crucial groundwork for the Urban Initiatives continuum that follows kids from elementary though high school, taking them from player, to captain, to coach. Urban Initiatives would like to send a huge thank you to Gene Barrett, Alex Bleiweiss, Maegan Boucher, Nicholette Cameron, Sam Cayemberg, Brianne Henrichs, Justine Kessler, Rick Marquardt, Loren Martell, Ryan Nugent, Tyler Richards, David Rodgers, Cliff Sakutukwa, and Alex Schenider for their hard work and dedication. As we close the book on another successful marathon season, we are already gearing up for the 2017 Bank of America Chicago Marathon. If you would like to join Team Urban Initiatives for next year’s marathon, please reach out to Jordan Lantz at jordan@urbaninitiatives.org. We look forward to expanding our team!